Well, I’m here to say that’s not the case. Not everyone. It takes a special set of skills but also a mindset and I would go so far as to say, a certain personality as well. Yes, most people can use a computer these days, but that doesn’t mean they’re good at it. Yes, most people are on the internet these days, and are using social media, but that also doesn’t mean they’re good at it or know how to use it properly. Not everyone has good keyboarding skills and I believe these are essential, no matter what program you’re using to provide a service. I believe maturity plays a big part too, rather than age. We all know people who just don’t act their age, even when older. Not everyone has the ability to get on with others and have the ability to put themselves in other people’s shoes – something good VAs often need to do when working with their clients. Not everyone can cope with being home alone in their own office all day long, every day – it takes a certain kind of person (Read my past posts about the possible effects of depression when working at home). And there is an increasing number of people worldwide (not just in this industry) who seem to lack ethics and a sense of propriety. Professionalism is an important part of running a successful business. Ultimately people need to realise that the buck stops with them – they can’t lay blame on others if something isn’t working right. And even when you do have your act together, can handle your computer and software well, understand how to use social media (and know the difference between a profile and a page), and get along well with others, there’s still the need to be able to market your business and promote yourself, be prepared to go out and network (not just online) and be willing to constantly learn and improve your skillset – things do not stay still in this industry, or this world, for that matter. Despite what many say out there, it’s not a get rich quick scheme, you won’t get lots of clients in a short space of time and while you can earn a full time income if you’re prepared to put in the foundations and build your business properly, it doesn’t happen in a short space of time. It can often take anywhere between 6 months to 3 years to build a full time income, depending on the services you provide and how proactive you are at building your business. If you’re fortunate to pick up 3-4 clients quickly then I agree it could be done in less time, but only few achieve this, not all. And if you only have one client but are earning a full time income – well I’m sorry, but that puts you in a virtual employee role, not a VA role. If you lost that ‘client’ you’d lose your business too. There are so many who have barely been a VA, desperate to start taking others under their wings and teach them how to be a VA too and yet may have only handed in one, two or three tax returns themselves. There is something to be said for biding your time, waiting not only for opportunities, but also for experience to build upon so you can have solid foundations in place. If you want to become a Virtual Assistant – that’s great! But be prepared to do your research, on what you need to do to set up, what kind of skills you may need to develop and even who you take your learning from. Make sure that whoever it is, they have walked their talk. Taking time to do things in the right way from the start should hopefully prevent a lot of heartache and frustration further down the track. Remember, not everyone is cut out to be a VA. Regular readers here will know that I often write and talk about the importance of networking and belonging to groups to help build both you, and your business. I came across a post today, written by fellow long-time VA, Kathy Colaiacovo who is based in Canada. She shares about Professional Development: How One Membership brought her $625,000 + in Revenue. Well worth the read. If you’ve ever questioned how belonging to VA Networks and other business groups, going to conferences and other events, and taking courses could really benefit you and your business you must read this post. Especially if you think you can’t afford to go. The reality is you can’t afford not to go. I won’t try to replicate all of what she’s written in my own terms, but I will share part of my own journey. As you are most likely aware, when I began my own business journey, there were no VA networks, no VA conferences or anything of that nature. However, there were business networking groups, business conferences and seminars and so on. I had read a book ‘Networking for $uccess‘ by Robyn Henderson, the year before I began my business, so I knew what I had to do. I had to go out and network! These days you can do it online too, but back then, you couldn’t. Online didn’t exist. I urge you to consider you need to do BOTH – many of the clients I have today are a direct result of meeting someone in person face-to-face – not via an online network. I was already a member of the Institute of Professional Secretaries Australia (now AIOP) and they were actually my first regular client. I ran their Secretariat for about 6 months or so. The first business network I joined was The Leads Club here in Melbourne and that was my introduction to business networking. I learnt how to tell people about my business, gain referrals, give referrals and the value of ‘what goes around comes around’. 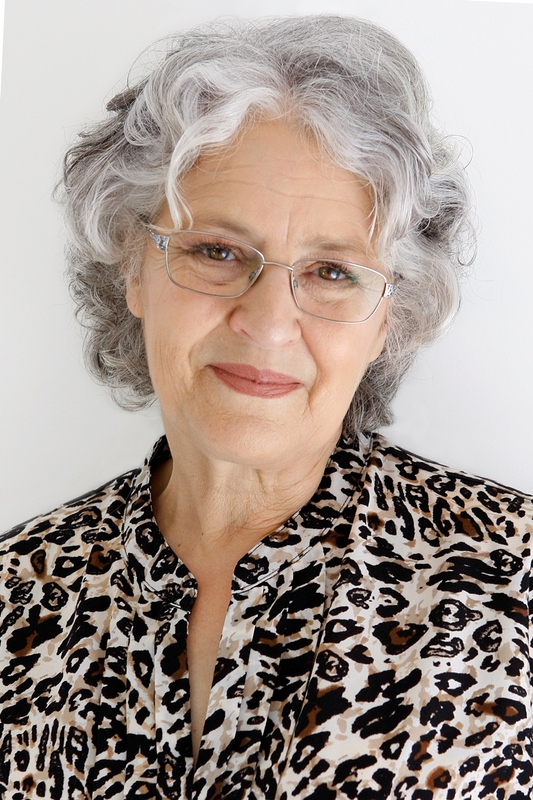 I then joined the Micro Business Network run by Barbara Gabogrecan and later Business Network International (BNI) which was brought to Melbourne by a client of mine, Stuart Riley. I remained with BNI for 15 years here in Melbourne, fulfilling roles of President, Treasurer, Secretary, Visitor Host and other roles. I haven’t been a member for 3 years now but still give referrals to people I met through them – my accountant, my bookkeeper, the plumber, the aircon specialist, the electrician, the travel agent and others. And likewise, some of these still refer business to me, or are direct clients of mine. Other groups I joined was the National Speakers Association of Australia and later VA Networking, IVAA, Women’s Network Australia and more. While I’m not a member of all these today, I still service clients I met through these avenues. Some of these clients have been with me for well over 10 and some beyond 15 years. Many of these clients have referred me on to other clients. I’d have to do a bit of research through multiple years of bookkeeping (I should have done what Kathy has done) to verify how much income has come from these sources but I can safely say in just 7 years that’s amounted to more than $527,000. One of these clients I was introduced to after participating in a speed networking event 6 years ago and they are a regular weekly, almost daily, client. Had I decided not to go to that one event that day, which involved a drive into the city from my hills property, I would have missed out on over $50,000 in income. Another client I met over 7 years ago simply because I volunteered to build and manage a website for a women’s group which I’d learnt about through a Christian writers group and, likewise, that client has brought in similar income. Two other clients who have contributed significantly to my income were as a result of workshops I attended – one was on business coaching, the other a photography workshop. You cannot underestimate the value of networking, participating, being involved and offering to help others. You do not know where it’s going to lead, who is going to tell others about you, and you gain significantly in your own personal development and growth. And note, above, that one of my clients came from a photography workshop – nothing at all to do with my VA business but rather, a personal interest and passion. However, when that person providing the workshop learnt that I am a VA he was delighted because he needed a VA and who better than one with a passion for photography? 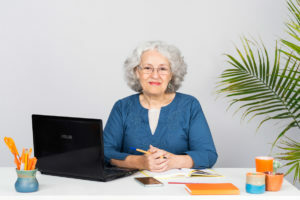 Just like Kathy on the article I shared at the start of this post, I’ve participated in all of these types of things which have helped build my business over the years. 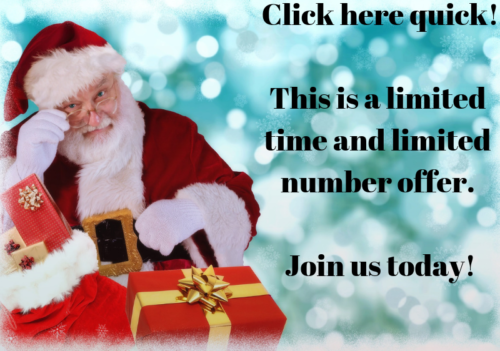 So, if you’re considering joining a VA Network, now is the time and I have a Christmas special on at the moment for new members. And if you’re interested in VA Coaching and Training then visit my VA Trainer website for more details. I also have a special there currently too. Both specials will close after Christmas Day. Perhaps they could be great gifts to you from a loved one? So, to recap, my reading that book ‘Networking for $success’ was instrumental in my believing that I needed to network and meet people to build my business and that’s exactly what I set out to do 25 years ago. I have never regretted that decision. And I know you won’t too. You just need to make the decision to get out there and meet people. Can you afford NOT to have a VA? It’s interesting seeing posts on social media from time to time, asking for an ‘affordable VA’. The operative word being ‘affordable’. And this can mean many things, depending on where you live, what currency you work with, and what you’re currently earning yourself and so on. It’s really quite relative, isn’t it? What people really need to think about is how much time they’d like to free up so they can continue to build their business. 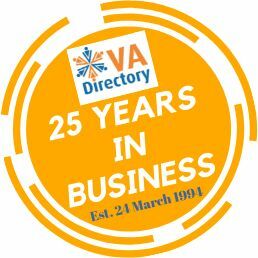 If you’re spending 2-10 hours a month on admin, bookkeeping and other things to maintain your business and it’s keeping you away from income generating activities, then the reality is you can’t afford not to have a VA. I have hanging on my wall, a prompt I got from Warwick Merry some time ago that says: Are you Marketing, Selling or Servicing? If not, then stop what you are doing and do one of these three things! Put it this way. If you’re earning $50 per hour for what you do, then you can afford to engage a VA for at least $35 an hour and use that now freed up time to generate more income for your business. Surely engaging a VA for around $70-$105 (2-3 hours), allowing you to earn $100-$350 is a plus for your business? I’ve put a higher amount there because what you can achieve in 2-3 hours is most likely completed in much quicker time by a VA. It’s quite possible they’ll free up to at least 5 hours of your time which is a much more useful way of getting your admin work done. Imagine what you can be doing with 5 extra hours in your business! Worth thinking about isn’t it? doesn’t automatically make me an employee. So many clients out there assume that because Virtual Assistants provide administrative and other office based support, that makes them an employee. It doesn’t. Even some accountants are advising this is the case. At least here in Australia. So important for you, whether you’re a VA or a client, to understand what being a Virtual Assistant means, in Australia, the US, UK, New Zealand and other western countries. VAs are independent contractors providing administrative, secretarial and web based support from their own premises on a virtual or remote basis. This can also mean transcription, bookkeeping, social media, website management, copy-writing and the list is endless these days. Many charge an hourly rate – others charge package rates. And note I said ‘charge a rate’. Clients do NOT choose how much they’ll pay a VA. They’re also not responsible for the VA’s insurances, taxes, superannuation, or other similar overheads required when carrying out work for clients. VAs, therefore, charge accordingly. They are NOT employees. VAs also have multiple clients – not one. If you’re a client, you do not get to dictate what hours the VA works, or what they can and can’t do in their own business or if they can work for others. 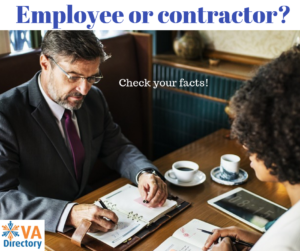 Although it’s possible you may need them to sign a non-compete contract if it’s important that they don’t provide services to competitors in your particular industry. For all intents and purposes, VAs are business owners. 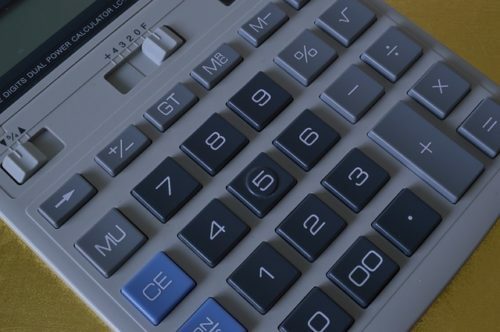 There is a calculator on the ATO website for Australian VAs but also, you can find out information at the Australian VA Association site. Click here for a relevant article. And another article here from Fair Work Australia. For those in the US, this article may apply. For those in the UK, this article may apply. Once upon a time, the 80/20 rule used to apply – relating to who provided you the most income. But it doesn’t anymore, it goes further than that. So, for VAs, important you have an Accountant on board who understands small business and is familiar with current legislation. And for the client, important that your Accountant also understands that VAs are not employees and shouldn’t be advising you that this is the case.